DIY Pumpkin Emojis Ready for Halloween! STEP 1: Cut the tops off your pumpkins and scoop out their insides! STEP 2: Take a pencil and draw a circle onto one side of the pumpkin, don’t worry if it’s not perfect, it’s pretty impossible since the shapes of pumpkins vary so much! This will be the outline of the emoji’s yellow faces! STEP 3: Take your pencil again and sketch out whichever emoji face you want to create. Next decide which part you want to cut out, on some of ours we cut out only the eyes, others just the mouth and on some we even did both! It’s entirely up to you, just get carving! STEP 4: Once you’re happy with your carved pumpkin, paint the entire circle yellow! You may need a couple of coats and don’t worry if you can’t see your pencil lines any more, those were just a rough guide for the carving stage. Leave to dry. Or put the hair dryer on them like we did! STEP 5: Adding in the colour, again this depends on which emojis you picked! For us, at this stage we painted on the red hearts in the eyes and on one of the mouths, we painted on the pink tongue and we painted on the white eyes and the blue forehead of the scared emoji! Next leave them to dry. STEP 6: Finally, take your sharpie and go around the edges! So you’ll want to outline the yellow circle and any details on the face. We also gave one of our emojis thick black eye brows! Then that’s it! You’re done! Display those pumpkins with pride! 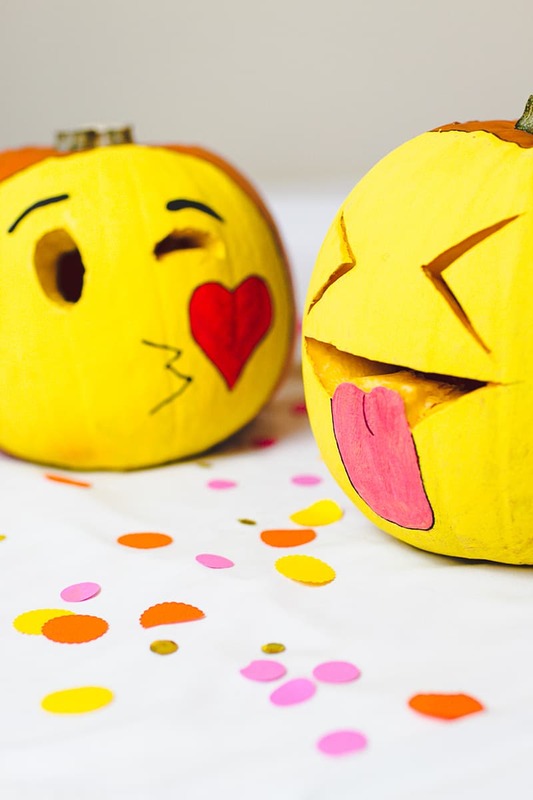 Don’t forget, we love to see your creations so if you do make your own pumpkin emojis be sure to share them with us on Instagram using the hashtag #BESPOKEBRIDEDIY! Happy Halloween y’all! Hahaha! These are brilliant. I love the idea of creating emoji faces – there are so many to choose from!! My friend and I too send whole messages that convey a whole sentence with just an emoji. Something traditional with a new perspective. Love them. Thanks Linda! Me and Jess are exactly the same we use Emoji’s all the time to have conversations 🙂 Happy Halloween!! !